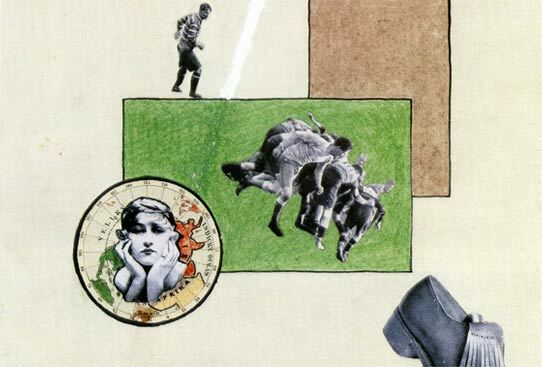 Photomontage—work made from cut and pasted photographic images—was pioneered as a technique for vanguard art in central Europe in early 1919, and it flourished there through the end of World War II. The artists of German Dada, such as John Heartfield, Max Ernst, and Hannah Höch, responded through photomontage to the awful mechanization and fragmentation of bodies during World War I. At the same time, the war resulted in political autonomy for subject peoples in the region’s toppled empires. Thus the Polish group Blok and the Czech collective Devětsil developed constructive, even upbeat themes that turned photomontage into a form of visual poetry or popular street theater. The jubilantly leaping and competing athletes in The Apotheosis of Sport, a work by sometime Devětsil associate Evžen Markalous, seem to bound into our viewing space (below): a celebration of postwar mobility from art into the spaces of everyday life.